BECOME A HORIZON CINEMAS REWARDS MEMBER. EARN FREE POPCORN, DRINKS AND MORE! Members receive 1 point for every $1 spent at the box office and concession stand. Earn great rewards starting at 45 points accumulated as well as a free refill with every large popcorn purchase! SIGN UP ONLINE OR VISIT ANY HORIZON CINEMAS LOCATION to become a rewards member for FREE!! 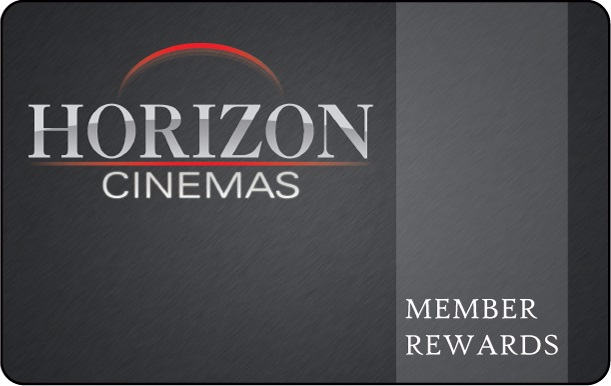 Member reward points are earned and redeemed at ANY Horizon Cinemas location. Members will receive 1 point for every $1 spent on ticket and concession purchases. To earn points, you must communicate you are a member with cashier. Members receive rewards in accordance with point redemption schedule above. Online, member must log in before purchasing advance tickets. Points cannot be added after transaction is complete. Horizon Cinemas reserves the right to change or alter the rewards structure at any time.